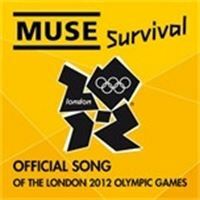 We are very excited to announce that a Muse song, Survival, has been selected by the London Olympic committee to be the main official song for the London 2012 Olympic Games. Matt wrote the song with the Olympics in mind. It's about total conviction and pure determination to win. The song will be played throughout the Games including when athletes enter the stadium, in the lead up to the medal ceremony and also as the theme for all international TV coverage. The worldwide radio exclusive will be tonight on BBC Radio 1 around 19:30 and will be available to buy on iTunes and in the muse.mu store immediately afterwards. We are honoured that the Olympics have chosen our song to officially represent the London 2012 Olympic Games across the globe.